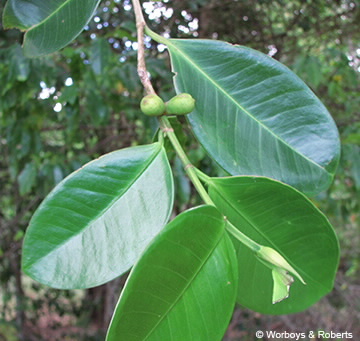 This strangler or banyan fig often has buttresses, copious white exudate (latex) produced from parts that are wounded; twigs triangular in cross-section. Leaves glabrous to 13 x 9 cm; stipules 10-15 mm long. Figs axillary, sessile, depressed to 10 mm, colour ranges from white to red to purple to black.